Eimear McBride's debut tells, with astonishing insight and in brutal detail, the story of a young woman's relationship with her brother, and the long shadow cast by his childhood brain tumour. Not so much a stream of consciousness, as an unconscious railing against a life that makes little sense, and a shocking and intimate insight into the thoughts, feelings and chaotic sexuality of a vulnerable and isolated protagonist, to read A Girl Is A Half-Formed Thing is to plunge inside its narrator's head, experiencing her world first-hand. This isn't always comfortable - but it is always a revelation. Touching on everything from family violence to sexuality and the personal struggle to remain intact in times of intense trauma, McBride writes with singular intensity, acute sensitivity and mordant wit. A Girl is a Half-formed Thing is moving, funny - and alarming. I had to read this one straight away and when I had started I couldn't put it down so I read it in one go. The subject matter is horrible but it's beautifully written. 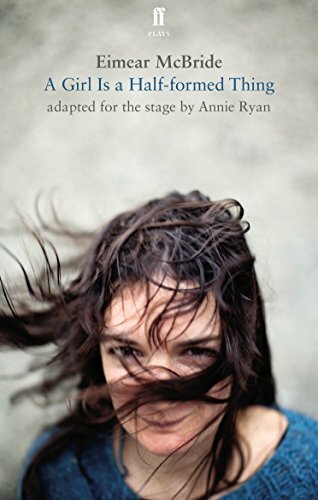 This is an adaption for the stage and I can't wait to read the actual novel, I think it's going to be even better. Almost immediately, this book is travelling again, it was that good. I hope it gets many readers! Thank you for sending me this play! I have Heard about the book, not sure where, probably at Gothenburg Book fair. Read this on the train to Stockholm. Wow. It's powerful, aching, sad and I get angry and hurt and I want to cry. I'd love to see it on stage. Stories like these must be told over and over again.